The construction phase of my new shop is nearing its end. Looking back, it’s clear what the driving force of all my design decisions was: poles. I was lucky enough to design my new basement shop from scratch, with the only catch being that I had to use an existing space. But since that space was just shy of 2,000 sq. ft. and I could do anything I wanted in it, it was a luxury indeed. However, that large, wonderful space had some drawbacks – seven support poles that, in all practicality, weren’t moveable. My first design sketch eliminated three of them right away by placing framing that embedded them inside the studs. A fourth was over near the furnace and water heater, outside the planned shop space and not a problem. One of the remaining three poles was close enough to the basement steps that I was able to extend framing from the existing staircase wall to embed it. With some tinkering of my design I was able to get rid of another pole by creating a closet against the steps to enclose it. The closet is just the right size and location for my dust collector – a real bonus. The six poles I dealt with were all more-or-less on the outer perimeter of the shop, but the last one was smack in the middle of the basement. No amount of clever design could incorporate it into a wall or closet, so I decided to embrace the pole instead of merely hiding it. I framed and drywalled around the pole and had my electrician drop a line for a quad outlet there. And, because that pole supports an I-beam about a foot from, and parallel to ceiling HVAC stuff, there’s a perfect gap up there to hide a dust duct running to the center of the room. Likewise, that gap is ideal for an air line. 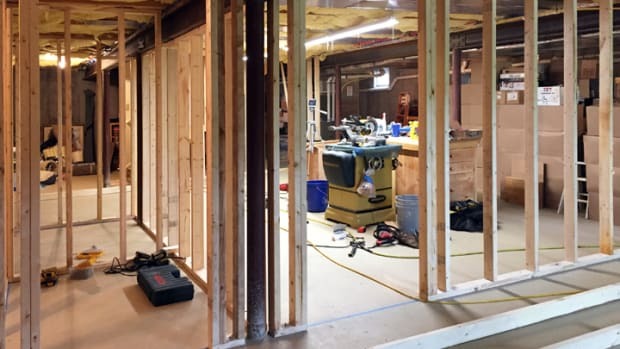 So, what was a detriment is now an effective means to bring electricity, dust collection and compressed air right to the center of the shop in the most efficient way. And that’s a three-way win for me. My new basement shop’s been fully operational for some time, but a lot of things remain undone. I moved one of those items over to the “done” list this week. My non-woodworking wife came up with a brilliant observation about my new shop, one that had never occurred to woodworking me. My shop build is finally underway, and I couldn’t be happier. Thought I’d share some of the progress. It’s Labor Day weekend, for all who celebrate. I plan to celebrate by laboring. I have a lot of shop work coming up, but none of it will take place in my shop. So, I have to take my shop with me.